Winds won't be quite as strong Tuesday night, but it will be cold. Mittens and gloves will be needed for the little ones as temperatures fall into the upper 30's around sunset, low to mid 30's by 8pm. The day will start off with plenty of cloud cover, but we should begin to see a little more sunshine by the afternoon. 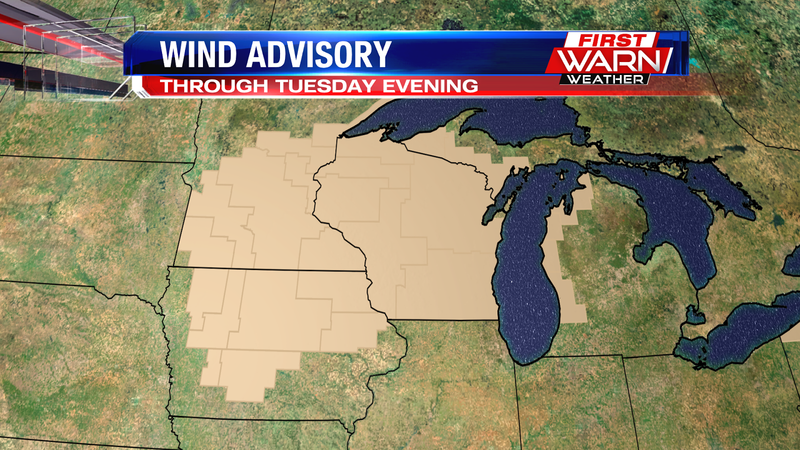 Winds will also begin to calm as high pressure settles to the south of northern Illinois. 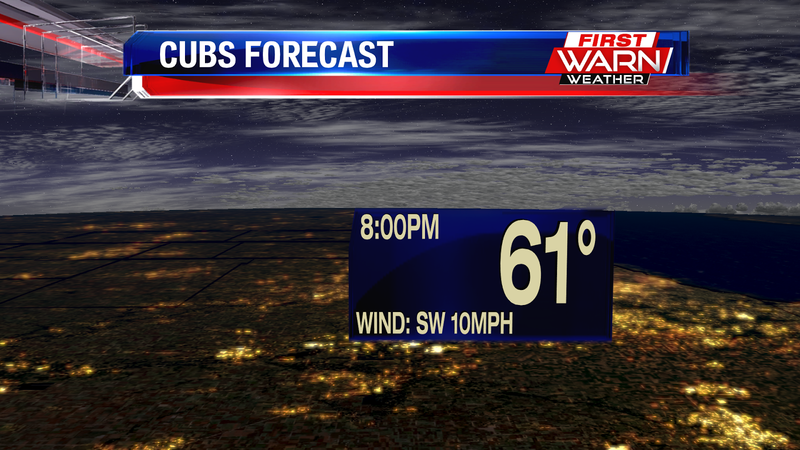 Cloud cover does move back in, though, late Tuesday evening. Temperatures Tuesday night will fall back into the upper 20's. It will be another day to make sure you have your Halloween decorations hunkered down, as our westerly winds will strengthen this afternoon. With an area of low pressure situated over northern Michigan, and surface high pressure moving in from the upper Plains, surface winds will begin to strengthen due to the difference in pressure. This is also known as a strong or tight pressure gradient. Surface winds have turned to the west behind the front this morning, and by lunch time they will pick up to 10-20 mph sustained. 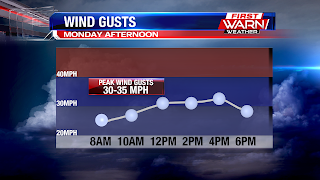 But they gust even high, expect winds to gust near 30-35mph through the late afternoon. 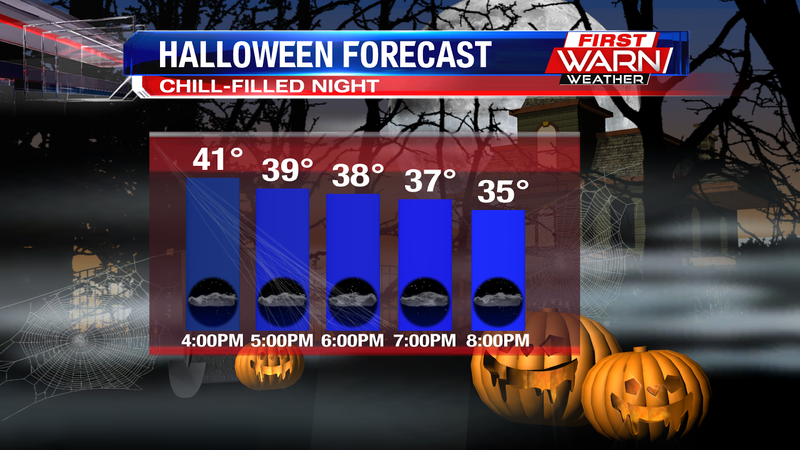 Westerly winds will stay gusty tonight, but die down a bit for Halloween! Freeze Warnings were in place late Saturday night and early Sunday morning in anticipation of temperatures falling into the mid 20's. For many a hard freeze occurred, ending the growing season. 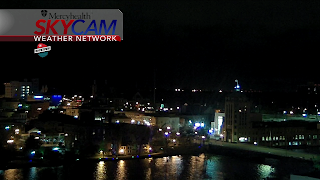 Skies cleared late Saturday evening as a ridge of high pressure moved into northern Illinois and southern Wisconsin. This allowed temperatures to quickly drop into the mid and upper 20's. 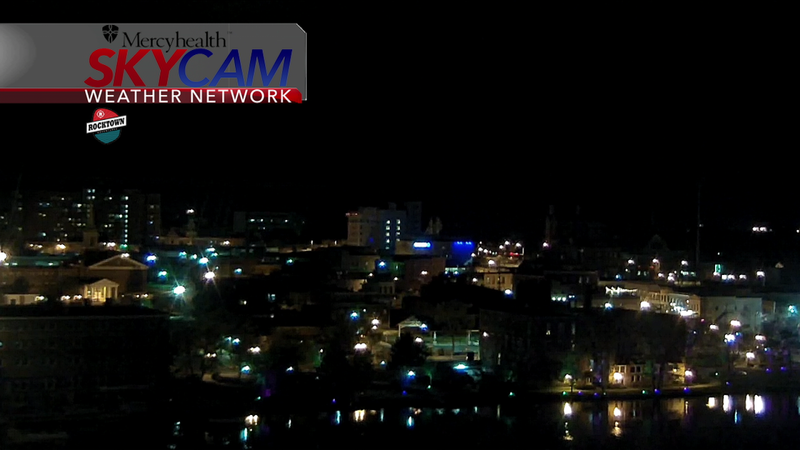 But if you look to the west, overnight lows fell into the low 20's in Galena. Sunshine and a light breeze from the southwest Sunday helped warm temperatures into the mid 40's, still about ten degrees below average but a slight improvement over highs Friday and Saturday. 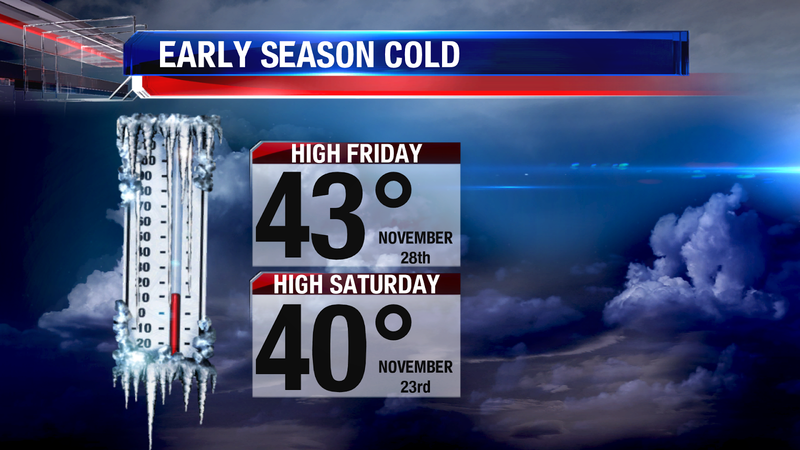 Highs on Saturday only warmed to 40 degrees, and into the low 40's on Friday. Average highs for the end of October should be in the mid to upper 50's, making the start of the weekend feel more like the end of November. A wintry start to what is supposed to be a typical fall weekend, and that wintry feel is only going to get colder as we go through the overnight tonight. 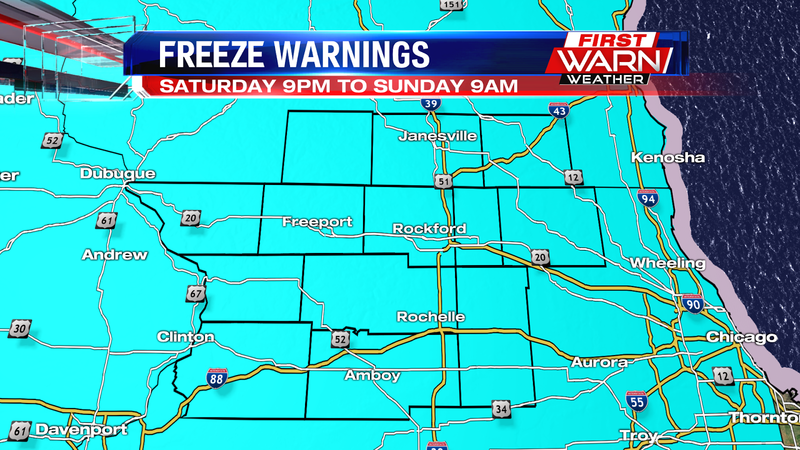 A Freeze Warning is in place across the Stateline as temperatures will be dropping into the upper 20's during the overnight tonight. Along with that, temperatures will drop quickly, so be sure to get valuable plants or anything else that you don't want to freeze into your home as soon as possible. Fog will also be possible going through the overnight as wind speeds will be low in addition to those temperatures cooling quickly. Luckily, it'll be a little bit warmer to end the weekend as temperatures will be around 47° Sunday afternoon with partly cloudy skies. Rain chances kick in for us tomorrow late at night, but we stay dry in the meantime. We've got another low pressure system that'll be moving in tomorrow night, and this is going to keep that cold air flowing into our area for the next few days. Temperatures will stay in the 40's for most of next week, but we are looking to end the work week on a lighter note. Once this low pressure moves out, another low will move in from the west and bring some warm air into our area, which will bring us to around 50° on Thursday, and possibly a little warmer for next weekend. Unfortunately, Halloween will be included in the colder period, as temperatures will only be around 43° Tuesday afternoon. During Trick of Treating hours temperatures will cool to the upper 30's, so be sure to bring a thick jacket if taking the kids Trick or Treating. 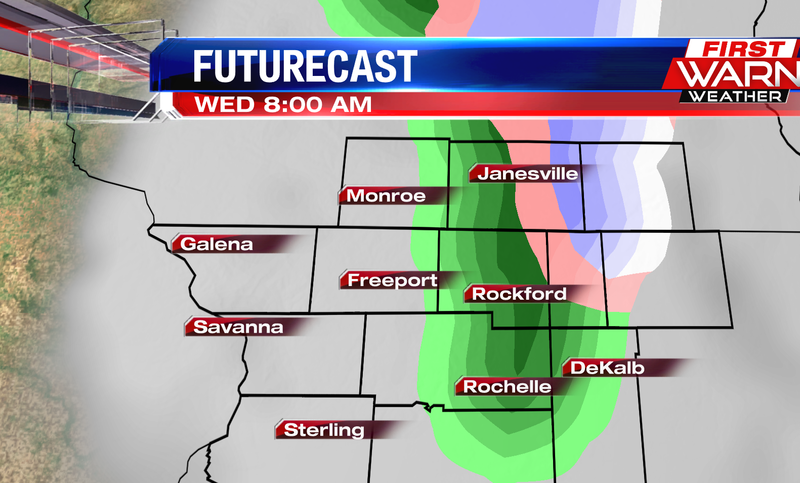 There is a chance for a rain/snow mix, but that's not looking to move in until the overnight Tuesday night. Cold and cloudy. Not exactly what we had in mind for the end of October sitting in the mid 30's during the evening hours! We're supposed to be seeing highs in the mid to upper 50's, but we've only gotten highs in the mid 40's and it's looking to stay that way for a while. A low pressure system to the north is pushing substantial amounts of cold air into our area, which is why we're 10° below average. That low is also pushing a rain/snow mix through our area, but its fairly light overall. It'll become a little more scattered during the overnight, but by the time it moves out a little after 8am Saturday, the accumulation will be very light. Afterwards, even though the wintry mix will be gone, the cold air will keep coming, and this will only allow for highs around 43° Saturday afternoon. With this strong inflow of cold air, our overnight temperatures will be taking a hit as well, as we'll be cooling down into the upper 20's Saturday night. 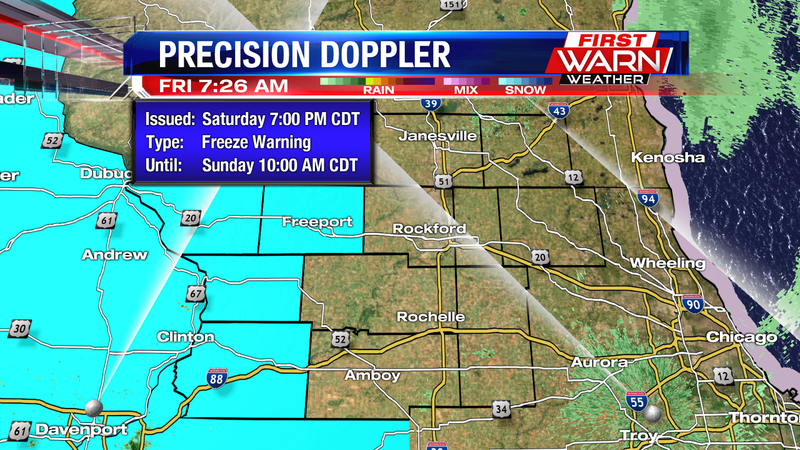 This prompted a Freeze Warning over our area, in effect from Saturday at 9pm to Sunday at 9am. Be sure to bring anything valuable you have outside into your home, because this quick and unseasonable drop in temperatures will allow for a killing freeze. The winter-like weather will be staying with us for the next several days, and temperatures near 50° will only be possible towards the end of the work week next week. 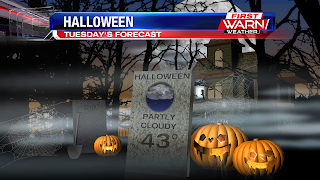 And yes....this means Halloween is looking to be a cold one, with highs only expected to make it into the low 40's on Tuesday. However, during the evening, those temperatures will be in the 30's, so if your kids plant to Trick of Treat, a winter coat will definitely be needed! Hopefully you got to go outside and enjoy a very nice day yesterday, because today will be anything but. 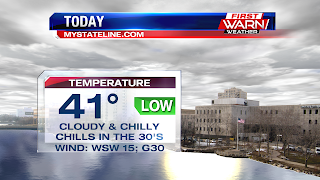 It will be a blustery afternoon, with cloudy skies and high temperatures only climbing into the low to mid 40's. But it will feel colder, chills will be stuck in the 30's this afternoon as winds gust out of the west up to 30 mph. 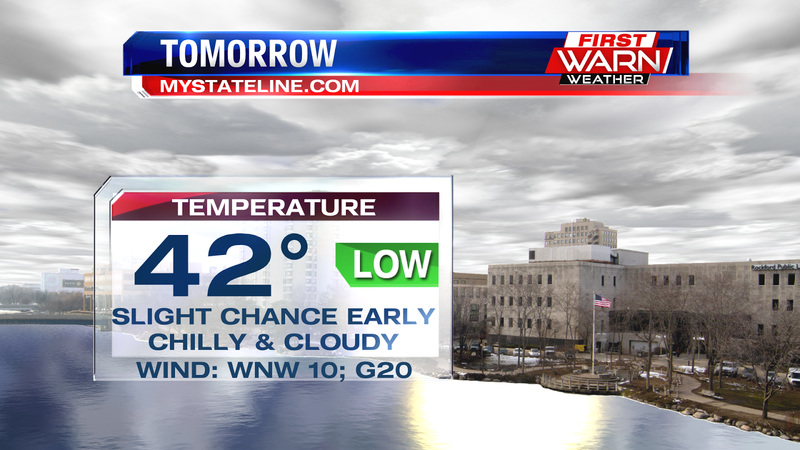 It will be a chilly evening, with lows in the 30's and chills into the 20's by tomorrow morning. As an upper level low moves into southern Wisconsin, its possible for an isolated shower or light mix by early tomorrow morning, but not accumulations will occur. 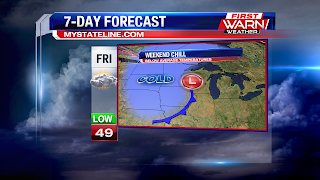 We'll copy and paste Friday's forecast into Saturday, highs in the low 40's with cloudy skies. Winds will stay gusty out of the northwest, up to 30 mph, making it feel like the 30's through the afternoon. 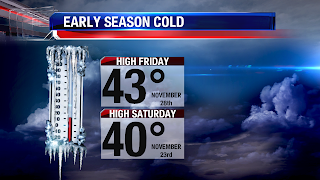 The bigger story this weekend though, will be falling temperatures Saturday night. A reinforcing push of cold air arrives Saturday night, which will push temperatures into the upper 20's by early Sunday morning. This would prompt our first killing freeze of the season. 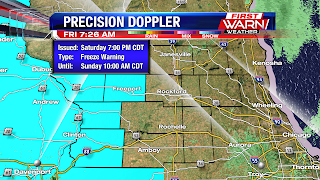 Right now, Stephenson, Jo Daviess, Carroll, and Whiteside counties are included in a Freeze Warning. However, I wouldn't be surprised if the rest of the Stateline gets added as we get closer to Saturday night. It's that time of year when we start talking about snow. Although it really hasn't felt like it with the near summer-like warmth many of us have been experiencing these past few weeks. But snow is in the forecast for parts of the Midwest, and the snow could add up by Friday evening. A strong area of low pressure will quickly move southeast out of Canada Wednesday evening and early Thursday morning. Warm air will be drawn into northern Illinois Thursday afternoon, bringing temperatures into the upper 50's. Behind the front is a very chilly air mass that is forecast to move in following the passage of the cold front early Friday morning. 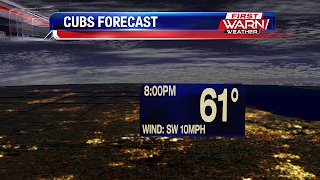 Precipitation will develop along a warm front late Thursday, which could bring a few showers into the Stateline during this time. Rain will develop over Wisconsin, north of the low, early Friday with snow developing on the backside of the low over Wisconsin, Minnesota and Iowa. 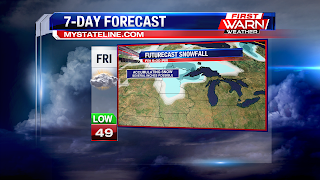 Accumulating snow will be likely with several inches adding up over far northern Wisconsin and the arrowhead of Minnesota by Friday evening. With a more active jet stream overhead and several bouts of cold air, any rain showers that do develop will have the potential to mix in with a few snowflakes, especially at night. 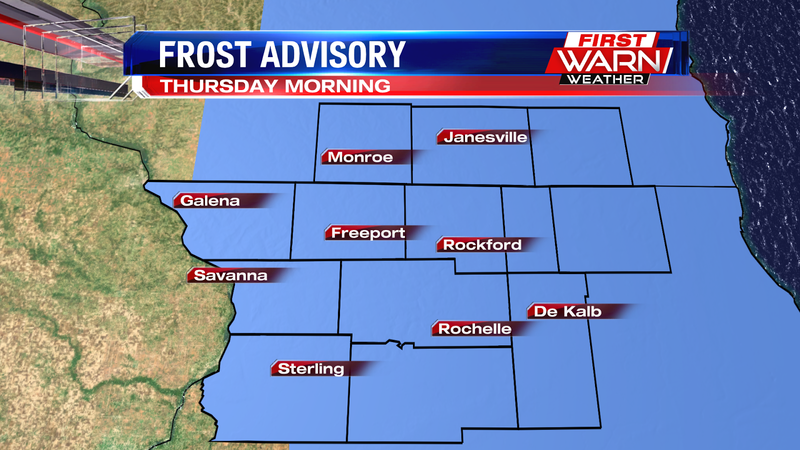 A Frost Advisory has been issued for all of southern Wisconsin and northern Illinois from Midnight through 8am Thursday. Clearing skies, a dry air mass and light winds are the perfect recipe for frost development. 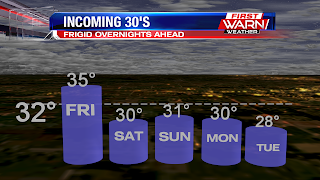 Overnight lows will drop into the low to mid 30's area wide, with frost likely developing early Thursday morning. I do not think this will be a heavy frost, but definitely a killing frost for plants or vegetables that may still be out in the garden. Be sure this evening to either bring in, or pick, anything you'd like to keep or save. 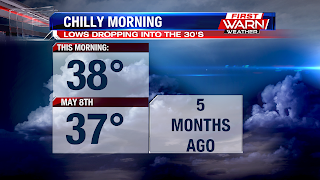 A chilly start this morning as we woke up to temperatures in the mid 30's; very cold! One of the coldest overnights we've had so far. We also had some light rain move through, making in a not-so-pleasant start. However, in that light rainfall, since our temperatures were near freezing, we did get a little bit of a rain/snow mix in various areas along the State line. Now that our temperatures have warmed up a little bit, we'll only be seeing the rain going through the morning and into the afternoon. The rain will start to clear out after 2pm, and by 4pm we'll start to see a little more sunshine, which will help warm our temperatures around 50's. 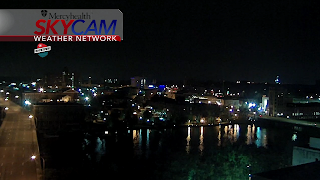 The skies will clear out tonight with dry, cool air moving in from the north. This will cool our temperatures quickly, and bring about another night in the 30's. Because of the rapidly cooling air, we could see some patchy frost tomorrow morning. A warm front will move in tomorrow afternoon, pushing warmth into our area before bringing some showers tomorrow evening and during the overnight. A cold front moving through during the overnight will keep the rain going, but most of all it'll cool our temperatures going into the weekend. Our overnight lows will take a hit, as multiple nights in a row we can expect to be overnight lows at or below freezing. We keep the mid 30's during the overnight until Saturday night, where we'll cool to around 30°, and if this cooling trend stays strong, we could possibly see the upper 20's on Halloween night. Say it isn't 'snow'!?! Not to worry - any accumulating snow is still a distance away, but snow will fall over parts of the Midwest and Great Lakes this week. The first round, early Wednesday morning. 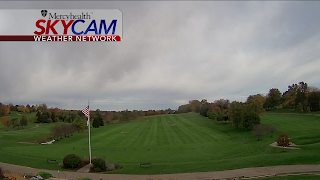 Skies are clearing following the thick cloud cover Tuesday afternoon. 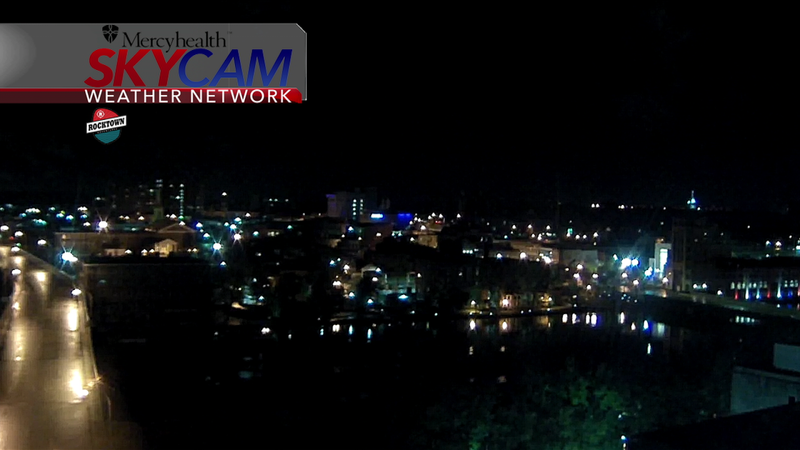 There is still a breeze and that breeze will most likely last through the overnight. This should help limit any development of frost. Cloud cover will be quick to build back in Wednesday morning ahead of a fast moving clipper system. This incoming low will pull a little moisture eastward with it. 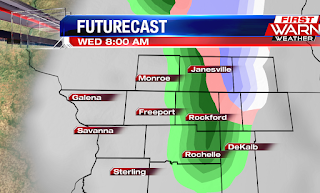 As that happens, precipitation will develop by daybreak Wednesday. Temperatures at the start of the day will be in the low 30's, cold enough to support a little wintry weather mixing in with the rain early Wednesday morning. 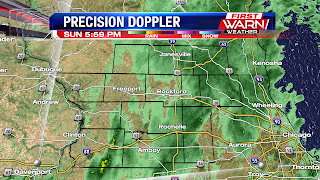 Right now it looks like the highest chance for precipitation (rain or snow) will occur from near Janesville, down to Rockford and Rochelle and to the east. Light snow showers will occur over central and east-central Wisconsin, with a few of those sliding into southeast Wisconsin during the morning. This isn't expected to be enough to cause issues for the morning commute, but you still may want to plan a little extra time just because it will be a little wet for the drive. Rain showers are already moving through Monday evening with a cold front that will usher in a much cooler air mass for Tuesday afternoon. 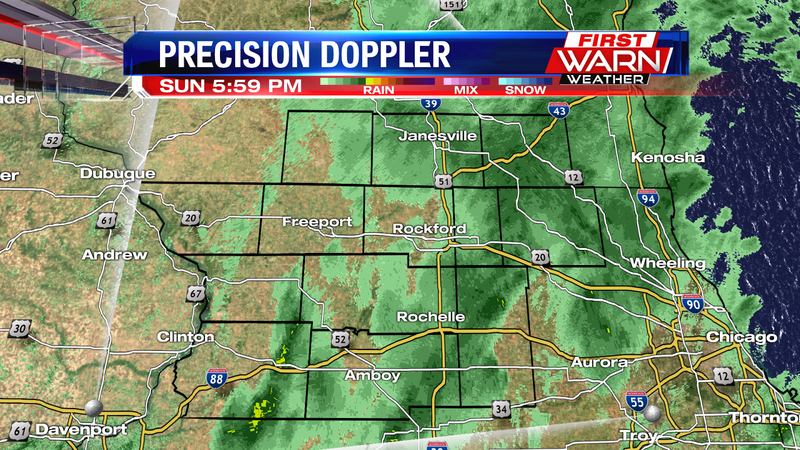 Light to moderate rain will continue this evening and into Tuesday, while picking up in intensity during the overnight. This is as low pressure spins up from the south and combines with the incoming cold front. Low pressure will quickly strengthen over Michigan by Tuesday afternoon, causing winds to increase around the center of the low. Wind gusts to 45 mph are possible over the Upper Midwest and Great Lakes, while wind gusts between 35-40 mph are likely closer to home. 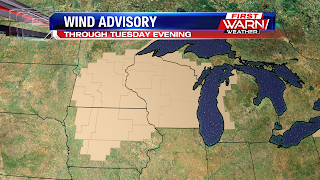 A Wind Advisory has been issued for Green, Rock and Walworth counties in southern Wisconsin beginning Tuesday at 7am and lasting through 7pm Tuesday evening. Tuesday is going to be a blustery and just down-right chilly afternoon. Temperatures from the surface to a couple thousand feet above will remain above freezing, but will be quickly dropping below freezing above that. I don't think there is much of a threat for a wintry mix locally on Tuesday, but for those north of Janesville and Madison there could be some snowflakes mixing in with the chilly rain during the afternoon and evening. 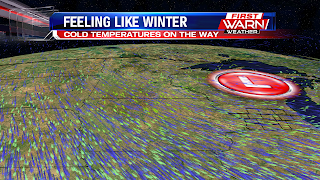 By the time our temperatures cool enough to support any wintry weather, most of the moisture should be done. Big changes are coming up in the forecast for the end of October. From temperatures reaching the mid to upper 70's late last week, to highs barely reaching the 50's by the end of this upcoming week it's going to feel a lot more like Fall. Our jet stream pattern will turn more from west to east - which we refer to as zonal flow - to more meridional flow - when we get the big dips and rises in the jet stream. With each dip in the jet stream, cold air will be pulled down south into the Plains, Midwest and Great Lakes. The first of those dips will arrive Tuesday with temperatures struggling to make it to 50 degrees. Scattered showers will develop through much of Tuesday and if temperatures are cold enough, it's possible there could be a few snowflakes mixing in with those rain showers. 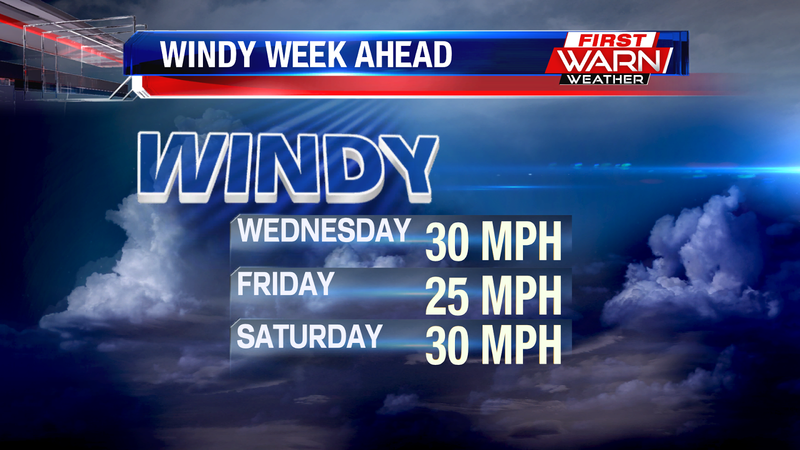 Winds will increase from the North with the afternoon becoming very blustery. Temperatures will rise a bit Wednesday and Thursday, but still remain below average. Second dip in the jet stream arrives for the start of the weekend, pushing highs Friday and Saturday into the mid and upper 40's. Overnight lows will drop back into low 30's several nights, which could very well put an end to our growing season with temperatures possibly falling below freezing. If we don't experience a freeze Tuesday night, I do believe we will experience a freeze this weekend. Light and steady rain will continue to fall over northern Illinois and southern Wisconsin Sunday evening following the passage of a cold front. Temperatures started off in the 60's Sunday, but then quickly fell back into the mid and low 50's once the front passed. The rain showers will turn light from west to east between 7pm and 8pm, but could return for some late Sunday night/early Monday morning with the arrival of another low pressure system from the south. 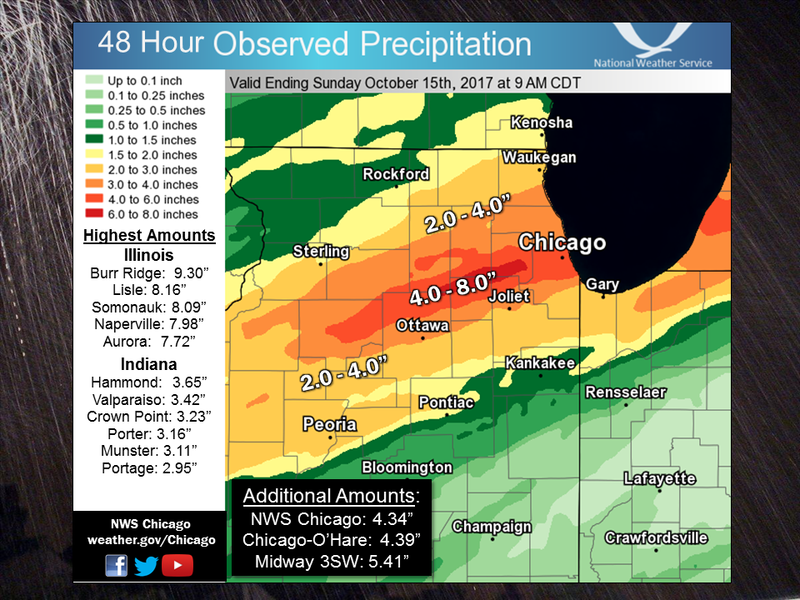 Rainfall totals so far have ranged anywhere from a quarter of an inch, up to three quarters inch from early Sunday morning. Light rain is possible for Monday, but will not be as persistent as the rain Sunday. Highs Monday warm into the upper 50's, to right around 60 degrees. We've been pretty spoiled this month when it comes to the weather, at least with the temperatures. The monthly average temperature for October is a whopping 6.8 degree above average! That's pretty impressive. But it looks like our luck is about to run out late next week. A cold front Sunday will knock high temperatures only down into the 60's for both Sunday and Monday. A second cold front late Monday night will push afternoon highs on Tuesday into the mid 50's. It'll feel colder, but only because we've become used to such mild weather. And actually highs in the 50's will be closer to our 'normal' temperature than what we are currently. Tuesday night will be cold, and most likely blustery. It looks like we'll have a little wind to deal with during the afternoon, along with scattered rain showers. 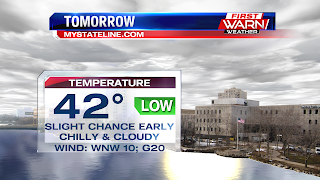 Depending on how much cloud cover sticks around Tuesday evening, overnight lows could fall into the mid 30's. By the end of next week another cold front, and a stronger one, will help pull down an even colder air mass over the Midwest and Great Lakes. This could push high temperatures on Friday only into the upper 40's! 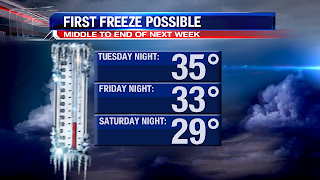 If we don't see a freeze Tuesday night, it's most likely to happen either next Friday or Saturday night. 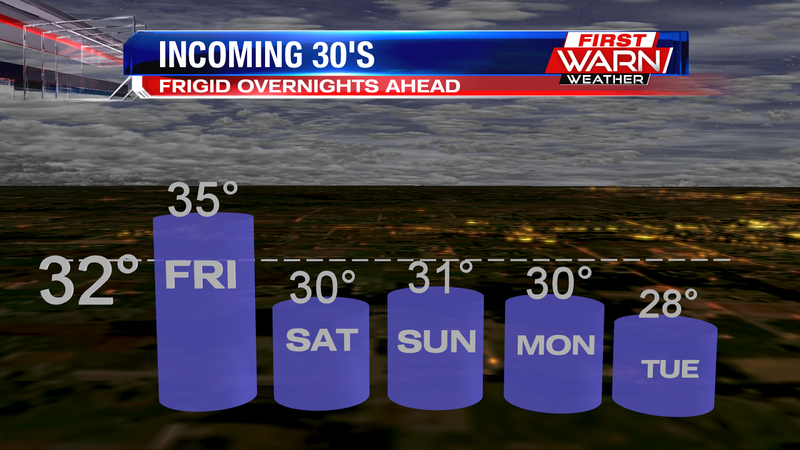 Temperatures Friday night could fall into the low 30's and Saturday night into the upper 20's! Typically our first fall freeze occurs anywhere between the 8th and 10th of October, with a hard freeze (28 degrees or colder) occurring about a week after. So get out and enjoy Saturday (even though it will be breezy and cloudy) because this may be our last mild weekend until next Spring. The early summer months were pretty wet with June and July recording monthly rainfall totals well above average. The pattern then changed drastically to a much more dry pattern during August and September, and even the beginning of October. 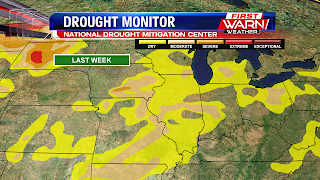 After several weeks of very little rainfall, the National Drought Mitigation Center put northern Illinois and southern Wisconsin under 'abnormally dry' conditions. 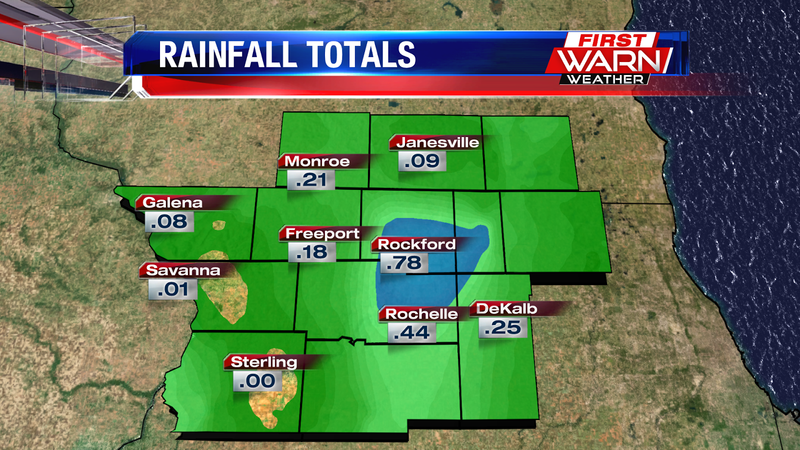 received enough rain to help put our monthly rainfall total for October above average. The first time that has happened since July. The latest release of the Drought Monitor shows the rainfall helped, at least locally. 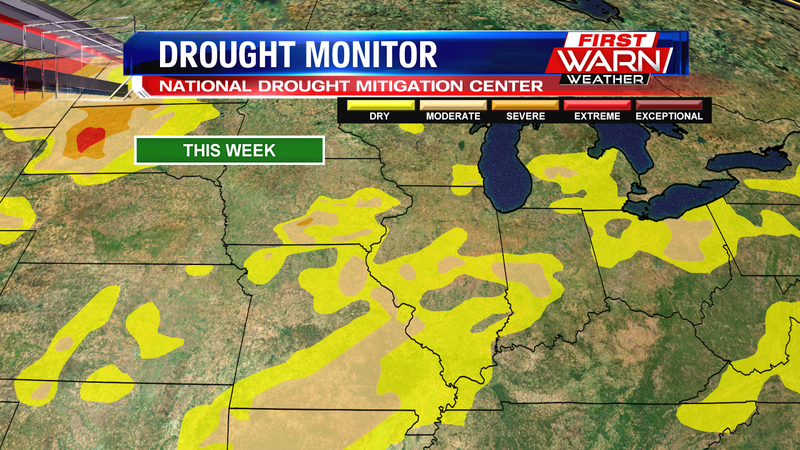 Dry conditions still remain over parts of Boone and McHenry counties, and southeast Wisconsin. 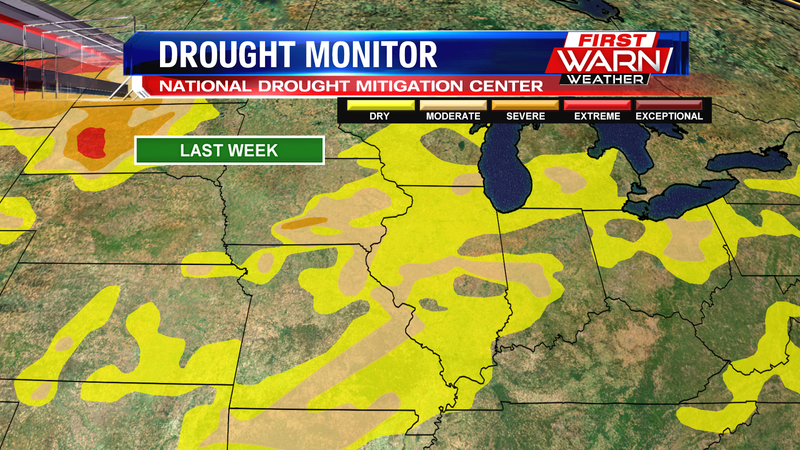 But if you compare the drought monitor from last week to this week, you'll notice an improvement. It doesn't look like we'll be entering into any extended dry period of time, at least in the near term. Next chance for rain arrives this Sunday. This week has been phenomenal, with highs climbing into the 70's for the past several days. The great weather continues into the first half of the weekend, with 70's in the forecast through Saturday. We won't notice as much sunshine Saturday, compared to the rest of the week, as moisture levels and clouds increase ahead of our next cold front. Our first cold front will pass Sunday, and will bring temperatures back near average, with highs in the 60s's through Monday. 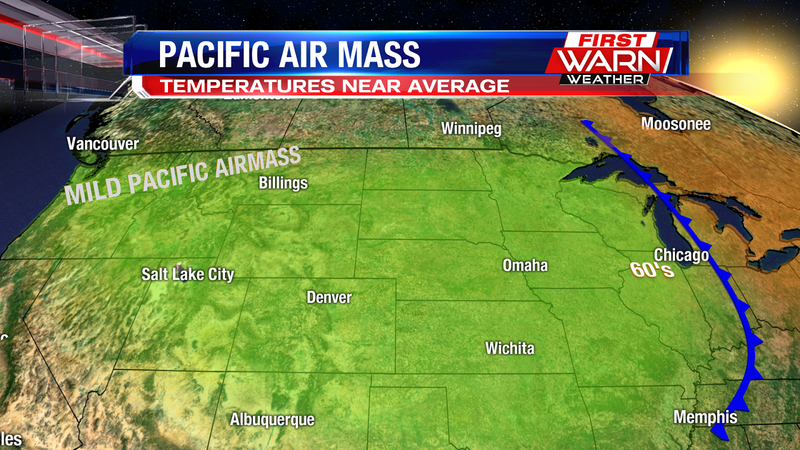 The reason it won't 'cool off' too much, is because the air mass behind the front originated in the Pacific Northwest. 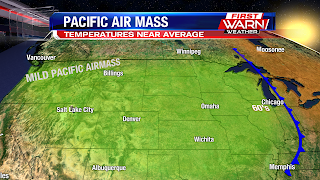 Air masses from this area are typically mild in nature. However, there is a pattern change on the horizon that will drop temperatures even more, and even has the potential to bring on the first freeze of the season. To find the reason for the pattern change, you have to look west......way west. We set our sights on the Pacific Ocean, near the Philippines. This is where now Typhoon Lan is positioned, to the east of Manilla. Typhoon Lan is forecast to strengthen to a Super Typhoon as it nears Japan this weekend. 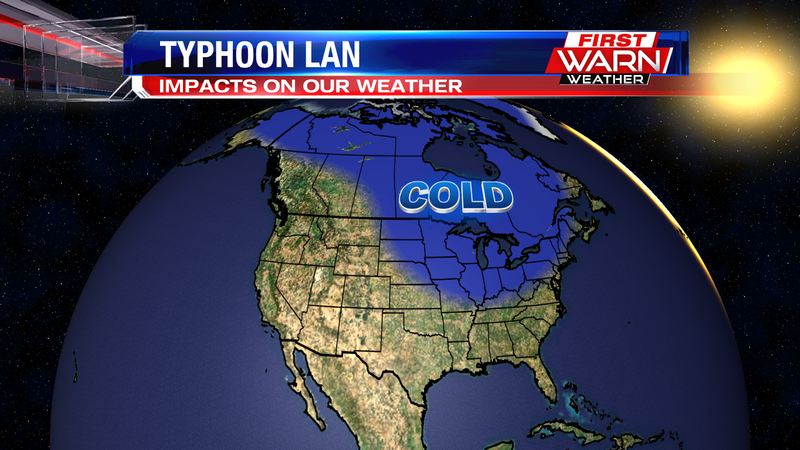 As Lan moves north, it forces jet stream winds north as well, and they strengthen. This will shuffle multiple lows along those jet winds this week. 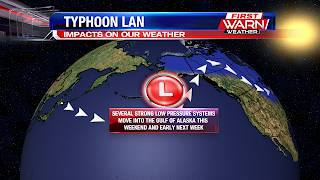 There will be a stronger low moving into the Gulf of Alaska into the weekend, which will create divergence and strengthening in the jet stream winds. As this happens, it will dislodge a colder Canadian air mass that will dive south across the Midwest, Plains, and east coast next week. Temperatures will crash into the low to mid 50's by the middle of next week, but overnight lows have the potential to fall into the 30's. 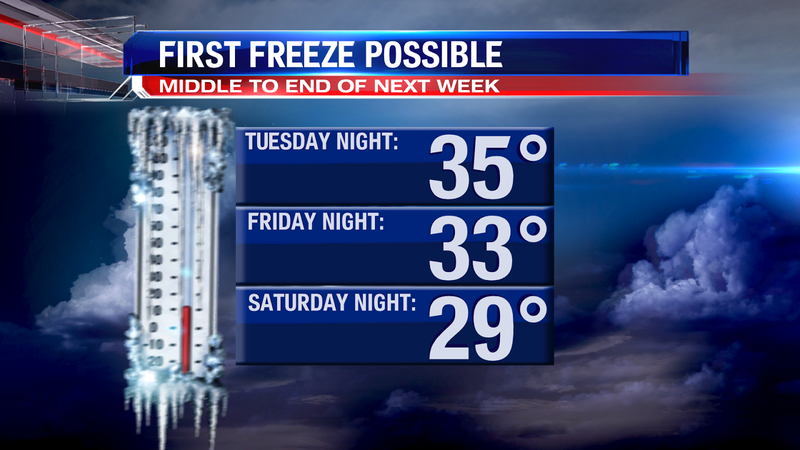 This could prompt the first freeze of the season! 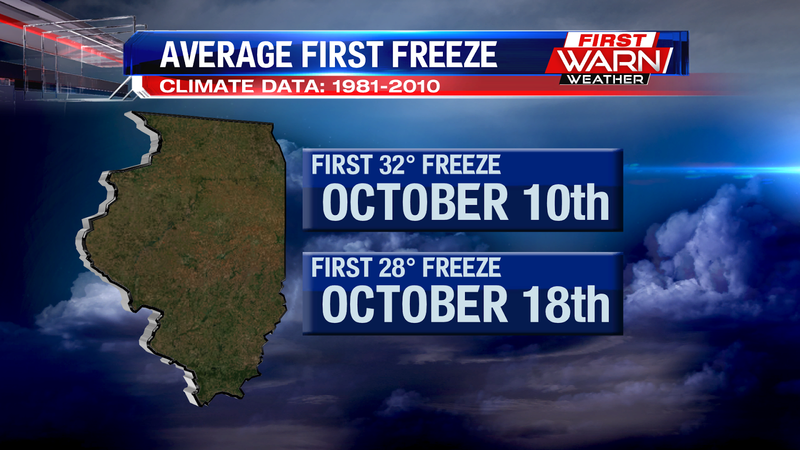 Typically the first freeze occurs on average the 10th of October. It's barely felt like fall and yet we're already looking ahead to the winter season. NOAA (National Oceanic and Atmospheric Administration) issued their 2017-2018 Winter Outlook for the United States. It's important to remember when looking at long range outlooks like these, that they should be taken more as a guide, rather than an absolute. There are many different variables forecasters and climatologists look at to help them put together long range forecasts. One such factor is the likelihood of La Niña conditions developing late this fall and winter. La Niña is when sea surface temperatures around the Equatorial Pacific show a cooling trend over a certain period of time - usually 3 months. The Climate Prediction Center has issued a La Niña Watch for the Northern Hemisphere. Typically, La Niña patterns tends to favor cooler than normal temperatures over the northern Rockies and far northern Plains, with drier than normal conditions over the south and wetter than normal conditions over the Ohio River Valley. 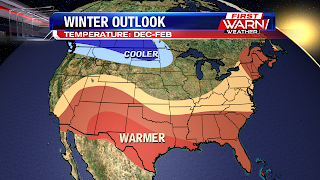 The 2017 and 2018 Winter Outlook calls for a higher probability for cooler than normal temperatures over the High Plains, with a higher probability of warmer than normal conditions over the south. There is a higher probability for wetter than normal conditions over the eastern Great Lakes and Ohio Valley, as well as for the northern Rockies. Drier than normal conditions are possible over the south, and especially over the southeast. 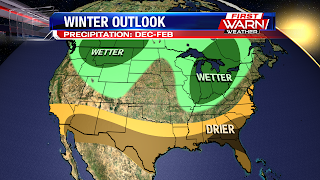 Snow lovers may look at this forecast and think that the 'wetter than normal' probability means more snowfall. And that's not necessarily the case. Snow storms, along with the strength and duration of cold spells, depends on individual storm systems as different weather patterns in the atmosphere develop. Mike Halpert, deputy director of NOAA's Climate Prediction Center says other factors that influence winter weather include the Arctic Oscillation, and the Madden-Julian Oscillation. The Arctic Oscillation influences how often cold air masses are pushed into the south and are often times difficult to predict more than a couple weeks in advance. If the Arctic Oscillation locks into a 'negative phase', then the likelihood of colder air into the lower 48 increases. So while it's interesting to look at these long range outlooks, it also important to understand that they can, and probably will, change. It's been a tough season for local farmers. From too much rainfall towards the end of Spring and beginning of Summer, to not enough rain during the months of August and September. Yield will most likely be affected, but the warmer weather did allow farmers to begin their soybean harvest about two weeks early. 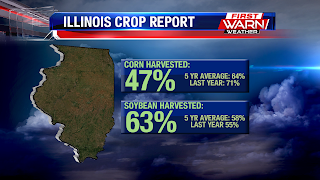 The weekly Illinois Crop Progress and Condition Report does show corn harvested is a bit behind schedule when compared to last year and the five year average. This most likely a result of farmers either having to replant their corn at the beginning of the season, or having to plant a different variety. 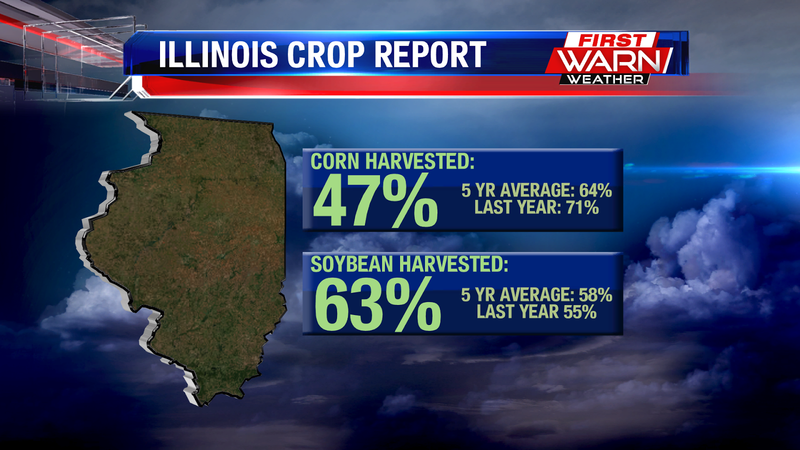 Soybeans harvested are actually doing fairly well throughout the state and are ahead of last year's progress and the five year average. The most recent rain over the weekend probably put some farmers a little behind schedule where fields were flooded. This occurred mostly southeast of the immediate area where training thunderstorms last Saturday and Saturday night brought nearly nine inches of rain in a few isolated spots. 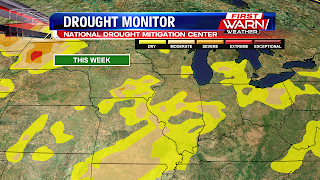 The weather this week will cooperate with the harvest and the wind will help dry out any fields that may still be a little too wet for farm equipment to move through. The next chance for rain arrives late Saturday evening and into Sunday. You wouldn't think we were nearing the end of October with our high temperatures trending over ten degrees above average, but at least its looking like it outside! 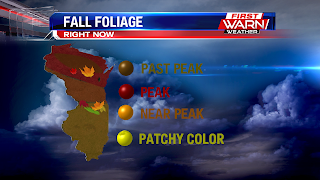 The fall colors in the Stateline area really starting to pop and will continue to over the next week or so. 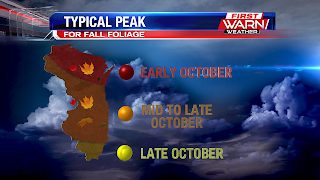 Typically in northern Illinois and southern Wisconsin, peak fall colors happen around the middle to end of October, so we may just be a smidge behind the times. This is most likely due to the stretch of dry and warm weather we've had across the Stateline in September and the begining of October. But now that the nights have been consistently crisp and cool, and the days have overall been sunny, the fall colors are really starting to show. Currently, only a few counties in northern Wisconsin are past peak,while much of northern and central Wisconsin is at peak color. Typically, this happens more towards the begining of october. Southern Wisconsin and northern Illinois are nearing peak colors while a little farther south of us, the fall colors are a bit more spotty. But with sunshine and temperatures in the 70's the next several days, it will be perfect weather to take a scenic drive. Along route 2 or into Wisconsin will be just the tip of the iceberg when it comes to some of the beautiful fall colors to be seen nearby! Winds are not expected to be overly strong this week, but wind gusts topping 30 mph are certainly possible, especially on Wednesday. 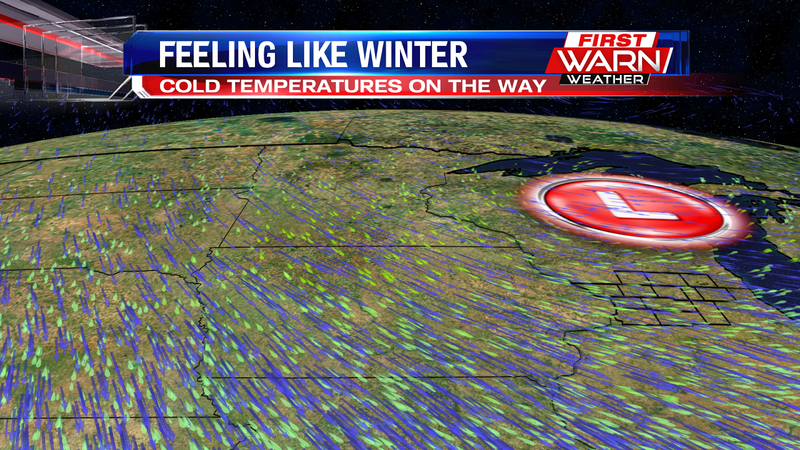 The direction of the wind makes a big difference in temperatures this time of the year. Southwest winds will help pull warmth from the south, warming temperatures into the low to mid 70's through the end of the week. Several low pressure systems will ride along the US/Canadian border this week, while high pressure sits over the southeast. The difference in pressure between the two will cause winds to become gusty at times. 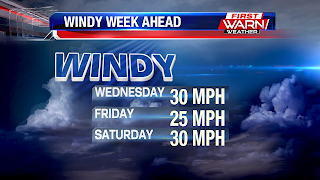 Southwest winds will last until a cold front moves through Saturday night. 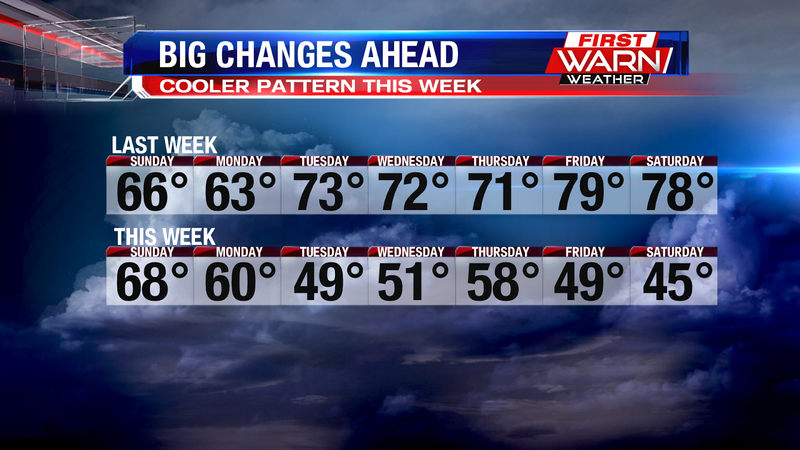 Cooler air does settle in behind the front with temperatures falling below average into next week. Weather shouldn't be an issue for the Cubs/Dodgers game Tuesday night. Crystal clear skies with a breeze from the southwest and temperatures in the low 60's can be expected at first pitch. As the sun sets, temperatures will cool rather quickly. By the end of the game expect low to mid 50's with a light breeze. Bring a jacket if you're heading out to Wrigley Field Tuesday evening. After a brisk start Monday morning, temperatures warmed up nicely for the afternoon. Highs in Rockford reached 63 degrees, spot on the average high temperature for the day. There will be a couple cool nights, but overall the week brings another warm up with temperatures rising nearly ten degrees above average. The reason for this warmer pattern has a lot to do with the placement of the jet stream. 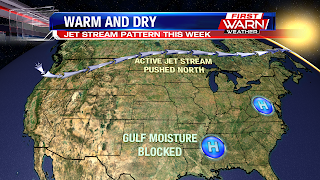 High pressure over the east and southern Plains remains locked in place this week. 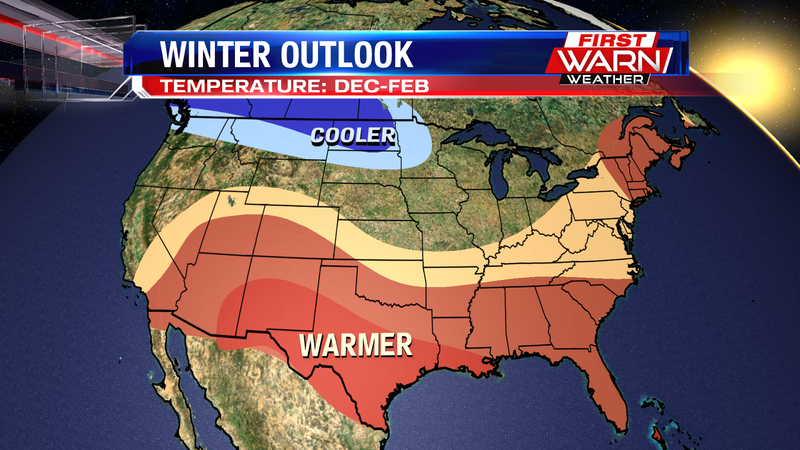 This means above average temperatures in the south and over much of the Midwest. Storms systems will move in from the west and follow the flow of the jet stream. High pressure to the south will block any movement of the storms to the south, keeping our skies dry through the end of the week. 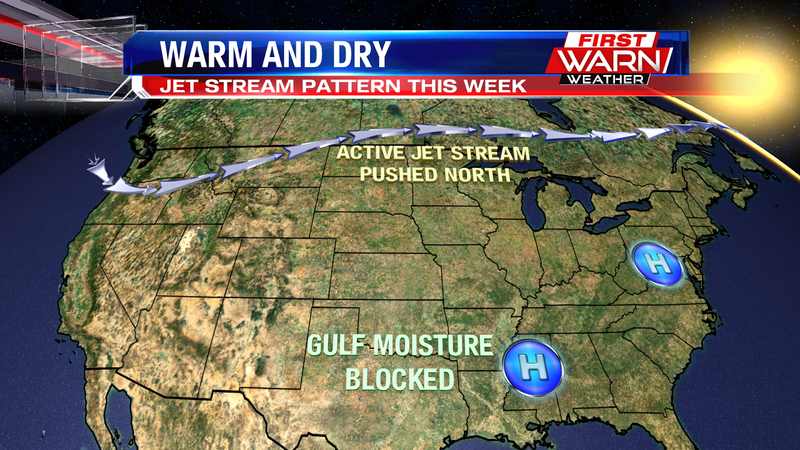 The jet stream pattern breaks down a bit over the weekend, sinking back south as low pressure moves in from the west. Moisture from the Gulf of Mexico will be pulled northward ahead of a cold front Saturday, bringing rain showers into Sunday. It looks like the weather pattern gets a little more active late next week and possibly towards the end of the month. 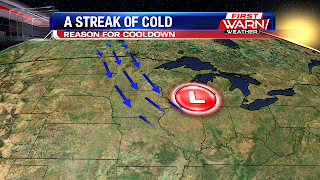 This could mean more of an opportunity for cooler air to be pulled south into the Stateline. 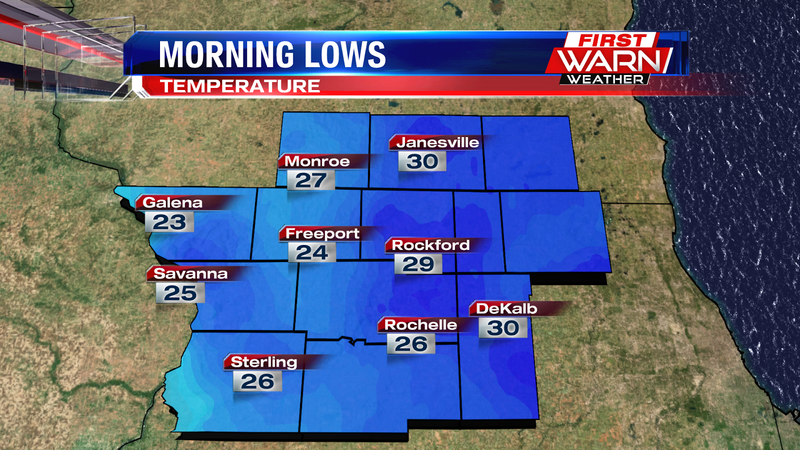 It's been a frosty morning across the Stateline, as temperatures have fallen into the mid to upper 30's for most. 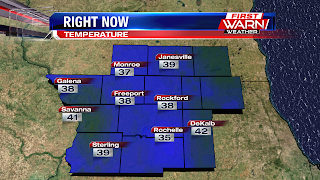 Galena's morning temperature fell all the way down to 35°, while Rockford hoovered around 38°. It hasn't been this chilly in the morning since early May, about five months ago! 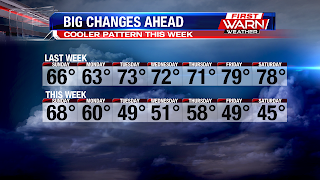 If you aren't a fan of the chilly temps don't worry, overnight lows moderate into the 50's by the weekend! 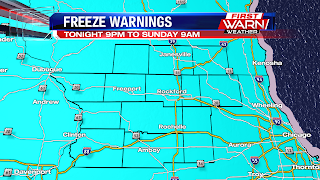 Temperatures Sunday night are forecast to fall into the upper 30's under partly cloudy skies. With winds turning light, patchy frost is possible over northern Illinois and southern Wisconsin by Monday morning. Widespread frost is not expected, but low lying and more typical 'cool' spots could develop patchy frost overnight. 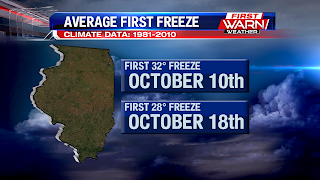 On average, we typically experience our first freeze - 32 degrees or cooler - around the 10th of October and our first hard freeze - 28 degrees or cooler - around the 18th of October. 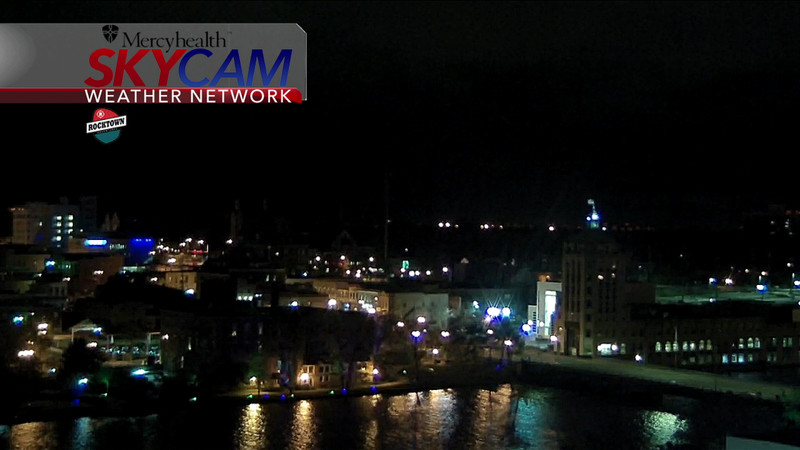 With such a mild fall so far, temperatures overnight have not fallen below 40 degrees in Rockford. 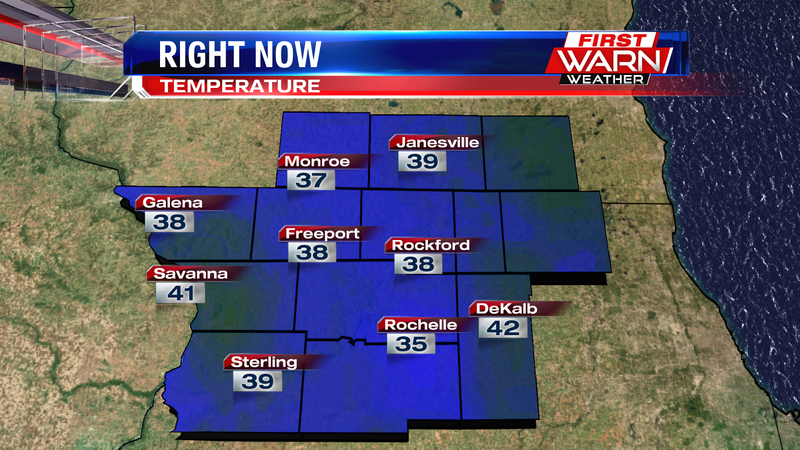 There have been some spots, like Freeport and Rochelle, that have experienced temperatures in the 30's. Monday morning will be our coolest morning this week. Winds shifting around to the southwest will bump not only high temperatures back into the 70's, but overnight lows back into the 40's and 50's. 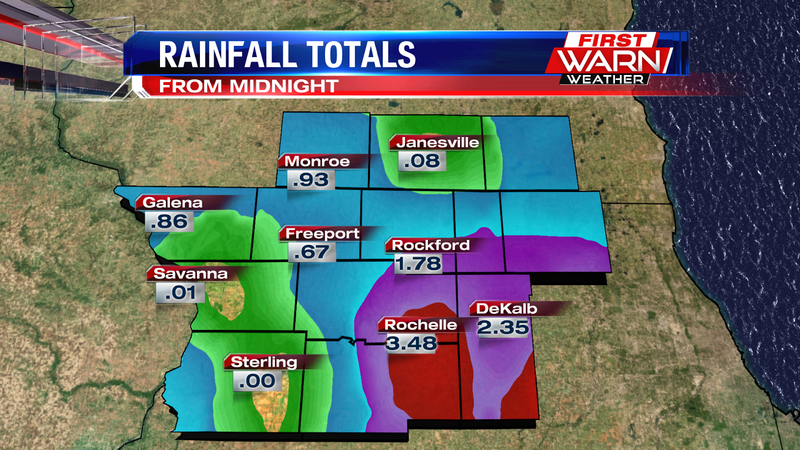 Several rounds of heavy rain occurred over the weekend, with the heaviest rain falling over Lee and DeKalb counties. The image on the left is observed rainfall totals - notice the axis of heavy rain to the south where anywhere between 5 inches to 9 inches of rain occurred. The extreme rainfall was a result of several training thunderstorms throughout the day Saturday. 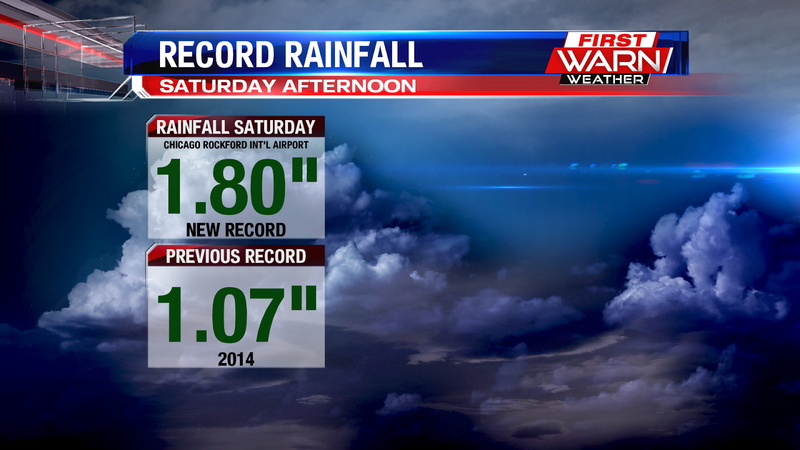 Rockford broke its daily rainfall record for Saturday with 1.80" of rain. 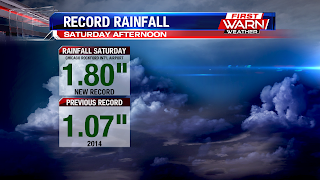 The old record was 1.07 inches set back in 2014. Thunderstorms also produced severe weather, with most of the damaging thunderstorms moving through west-central and central Illinois. 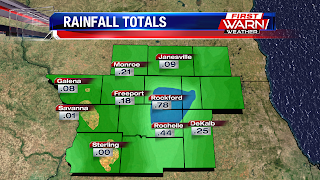 Click here for a full list of rainfall totals. 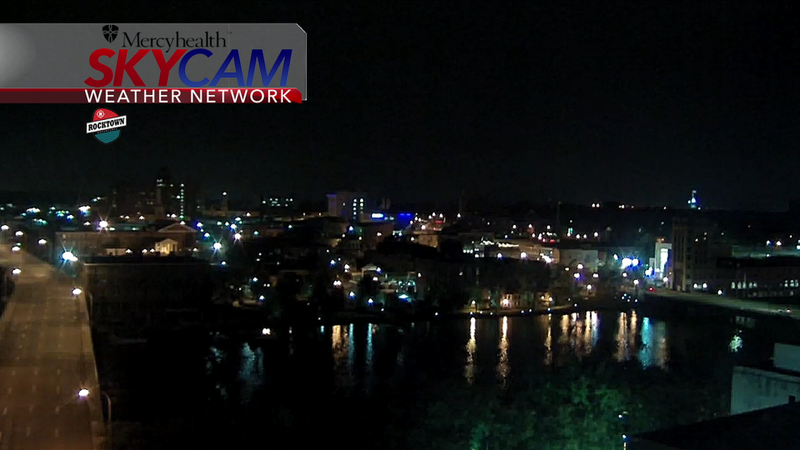 It's looking much more quiet over Rockford with our Mercyhealth Skycam. The thunderstorms, wind gusts, and heavy downpours are now out of our area. 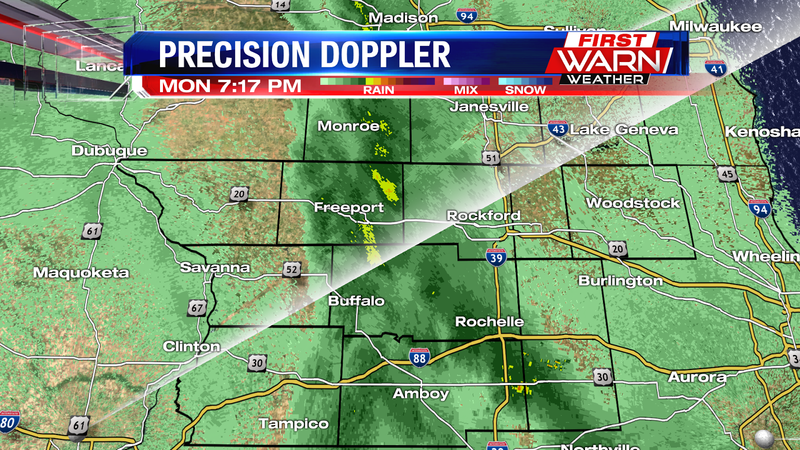 We'll continue to see rain during the overnight, but there will be much lighter rain showers. We can't rule out a few spots of heavier rain until 1am, but after that point it'll just be lighter rainfall. The lighter rain will stay with us through Sunday morning, before clearing out for the afternoon where we'll have very fall-like temperatures only hitting the mid 50's for our highs. Along with that, it'll be breezy with wind gusts looking to pick up to possibly 30mph. Skies will stay cloudy during Sunday afternoon, but will start to clear up during the evening. Along with that, cold air will keep pushing into our area, and these two factors will allow for some frigid temperatures during the overnight Monday night....in the upper 30's! However, if you don't like the cold, you're in luck because the sunshine returns for the work week and temperatures will warm back up. There is a chance we could hit the upper 70's by the end of the week. It'll be nice to get some dry time because we saw quite a bit of rain today, some locations seeing over 3 inches of rain! It's a good thing we've made up for the lack of rain we had last month, but localized flooding will definitely be a concern with how much rain we've seen. 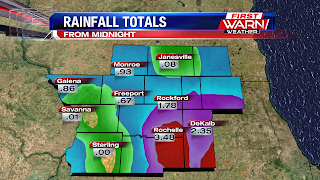 Flash flood watches are in place across the Stateline until 4am Sunday. 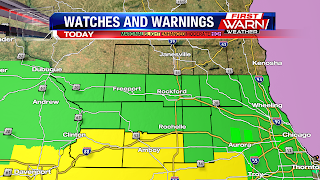 There are technically still two tornado watches in place in Carroll and Whiteside counties, but these aren't anything to be concerned with as the strong storms are now out of our area. We've had a cloudy end to the work week, only seeing a few peaks of sunshine during the late hours of the morning. Showers and thunderstorms moved in during the afternoon, but the thunderstorms have since died down. A few heavy rain showers still remain, but the count for those will go down as we go through the overnight as we'll mostly see Light to Moderate rain showers. Those showers will continue through the morning, before thunderstorms return during tomorrow afternoon. Most areas can expect to see right around three-tenths of an inch of rain by tomorrow morning. However, some places up north will be a little over half an inch as a stationary front allowed for more showers up to the north. We are under a Marginal Risk for severe weather tomorrow during the late afternoon and evening hours. The Stateline will be seeing scattered, heavy rain showers with a few thunderstorms, but the stronger thunderstorms will stay down south. However, some of these stronger storms will skim the southern portion of our viewing area. We can expect strong wind gusts from those storms, along with heavy downpours. 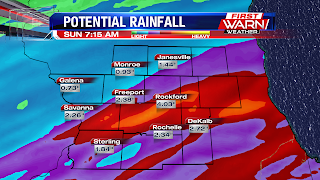 Most places across the Stateline can expect between 1-2 inches of rain total by Sunday morning, but a few places up north have the chance of seeing more rain as that stationary front will stay active. Winds will pick up quite across the Stateline during the overnight Saturday night as the low pressure system closes into our area. Everything will calm down after 1am Sunday morning, with only a little bit of lingering light rain through Sunday morning. Afterwards, we'll have a nice end to the weekend with partly cloudy skies and temperatures in the upper 50's for Sunday afternoon. Temperatures will be mild to start the work week in the low 60's, but we'll warm back up to the low 70's once we get closer to the end of the week. In the previous post you read about the potential for heavy rain this weekend, and that is now looking more and more likely. Rain will begin to move in late Friday afternoon and evening, but generally only about a quarter of an inch will fall. 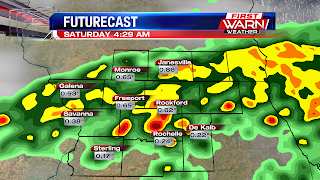 But the heavy rain threat really ramps up Saturday afternoon and evening. 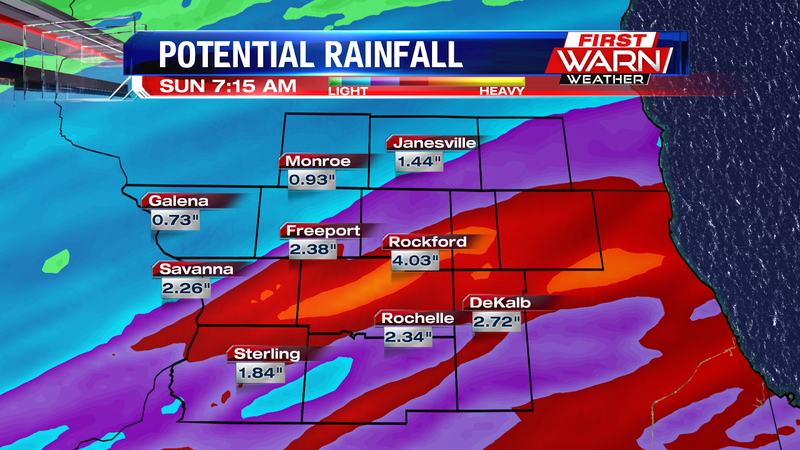 In general, 1.50"-2.50" of rain will fall, but in the stronger storms over 3" is more than possible. The available moisture in the atmosphere this weekend, is about 200% above what's typically found. There is a threat for strong to potentially severe storms. 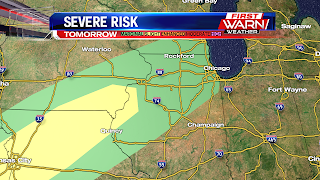 For northern Illinois and southern Wisconsin, a marginal severe weather outlook is in place. But, near the Quad Cities and southwest of that is where the 'slight' outlook, or higher potential for severe storms is. Heavy rain, strong winds, and hail will be possible in storms Saturday afternoon and evening. Even though we are in the middle of October, severe weather is still possible! Once the secondary cold front passes early Sunday morning, the threat for rain will end. We'll even notice some sunshine late Sunday afternoon. But it will be windy and feeling much cooler! Temperatures go from the low 70's Saturday to the low to mid 50's Sunday.